WE DID IT! I AM WALTZ has officially released EVERYWHERE! Thank you to everyone who supported me in making this book a possibility. I hope everyone is enjoying the book. Making the book exist is one thing, letting everyone else know about it is another, and I still need your help. Once you finish the book, I’d be very grateful to you if you leave a honest review on Amazon and/or Goodreads. We currently have 7 reviews on Amazon, but lets get this into the hundreds ASAP! The more reviews, the easier getting I Am Waltz 2 out will be! To review click the links for Amazon - Goodreads, or click the image below! Also, be sure to tell your friends about the book, lend it to them, encourage them to pick up a copy. Share on Facebook, Twitter, Instagram, real life, your blog, etc. Thank you all so much, and stay tuned for updates on I Am Waltz 2 which I am working on now, through the working title I Am Waltz: Project Monarch. I Am Waltz releases in 18 days! Are you prepared? Update Details: Will you receive your book?! (MUST READ INFO) | New Trailer | Official Cover | Goodreads Giveaway | and More! It has been a long time since so many of you pre-ordered the first in my new sci-fi trilogy, I Am Waltz. Again, thank you so much. Today, I am happy to announce that your patience has paid off and the wait is officially over, because I Am Waltz is releasing on 2/6/18! A good friend of mine worked closely with me since May of 2017 to create this promotional teaser trailer for I Am Waltz. I wanted to share the excitement with you and hope you all enjoy it. Please feel free to share with your friends and family on social media or in the real world and tell them how excited you are to be of the first to read I Am Waltz. 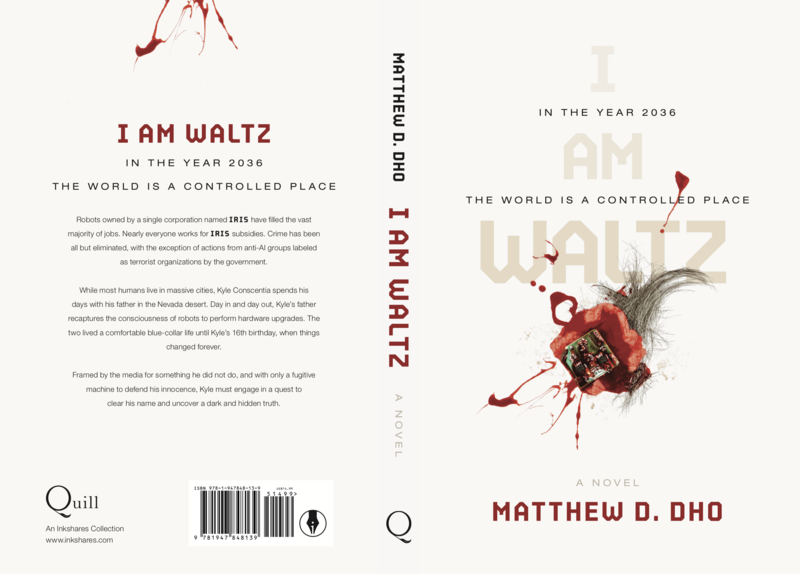 The very talented Jordan Butcher of Studio Workhorse designed the official front and back cover art for I Am Waltz and I am so excited to share it all with you. Please enjoy below and relish in the joy that soon you’ll be able to hold this cover in your very hands. Follow Studio Workhorse on Instagram and show some love. 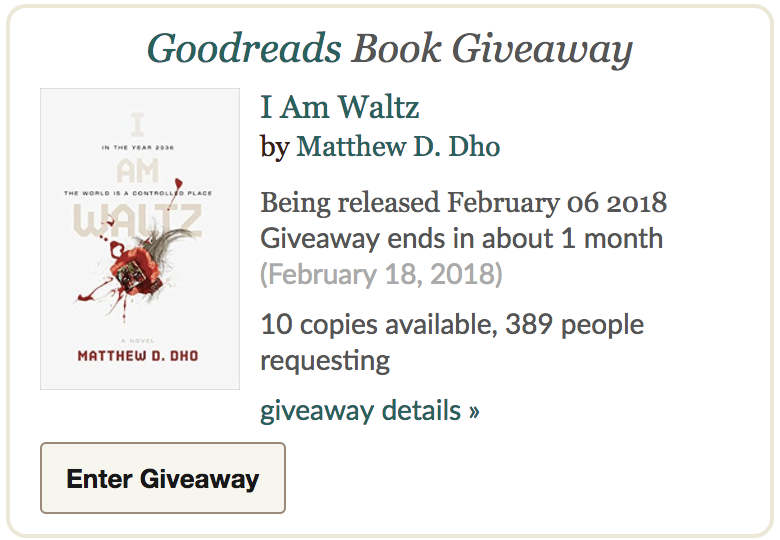 While many of you have ordered I Am Waltz already, we are excited to announce a new Goodreads Giveaway going now through 2/18/18 where anyone can enter to win 1 of 10 signed, first edition copies of I Am Waltz. If you’ve pre-ordered, please enter again and maybe you’ll win an additional copy for a friend, family member, or for your own selfish self! If you have not yet pre-ordered, go ahead and enter. Maybe you will win. But you should just order anyway. Share the Giveaway with your friends on Facebook and tell them how exciting it will be to read I Am Waltz together! The more the merrier! WILL YOU RECEIVE YOUR BOOK? As I said at the beginning of this email, many of you ordered I Am Waltz a long time ago. You may have moved in that time and I encourage all of you to login to your Inkshares account and make sure your address is up to date! The book releases in 18 days and I wouldn’t want you to miss out! Take action now! FOR THOSE WHO DID NOT ORDER YET? Some of you, who have actually read this deep into the email have not ordered the book! I wonder why? Hopefully the trailer, cover art, and fact that this book is real, releasing soon, and will be followed up by two awesome sequels has sold you on ordering. Well now you can order in so many places you have NO reason not to. But maybe you like other platforms, fine. I doubt anyone is still reading, but if you are, kudos to you. Again, thank you all again. Can’t wait for you all to read I Am Waltz and hear your feedback. Please leave reviews on Amazon when you finish reading and keep an eye out for updates on the sequel currently under working title IAW2. When do we get the book? Want to read unreleased chapters from I Am Waltz? If so, this is the email you want to read. As the editors work their way through the book I am putting up unedited versions of chapters. Links to new chapters are in the email below. Over the next few weeks, I will put on Inkshares chapters up to the end of Part I. You’ll have to wait for your personal copies of I Am Waltz to see what happens in Parts II and III. Have you bought yourself a copy? What about your family, friends, enemies? If you haven’t secured a copy yet for yourself or a loved one, please do. An ebook is $9.99 and a paperback is $14.99. It will help immensely if you pick up copies. Here are links to all existing chapters including the new ones! If you’ve not already shared I Am Waltz with friends and family on social media please do! Every single order of "I Am Waltz" helps me make the sequel and trilog possible! Wanted to give everyone an update on I Am Waltz. The book currently with Inkshares and will be going through the editing process before it is printed. Thank you all for your continued support and your patience. 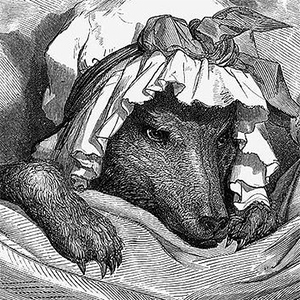 Inkshares has had the manuscript since December, however editing and working through all these books is a time-consuming process, so please hang in there with me. I will be starting book 2 soon. My goal is that shortly after you all receive your copies of I Am Waltz, I will be able to email out rough drafts of the first chapters of book 2. Please message me with any questions, I will be happy to answer. A BIG update. I Am Waltz has officially finished the developmental edit and is now with the copy editors at the publisher. The time is rapidly approaching now and books will be on there way during 2017. For those with signed paperbacks, the books will first be sent to me to sign, then the publisher will send them out to you all. Thank you all again for your continued support and I hope you all love I Am Waltz when you get it. Soon I will begin working on the sequel to this book and as promised all early adopters of I Am Waltz will be purvey to unique insight and tidbits/early drafts or the sequel. Wanted to drop you a quick line as to the production progress of I Am Waltz. The manuscript will be in the hands of the copy editors within the next few weeks (depending on when they finish their current work). I have been working furiously on the developmental edit since the funding was successful and am nearly complete. Once the manuscript begins copy-editing we will be well on our way to getting those books in your hands or on your devices. Again thank you all for your support. As promised, once the book is out, all those who have pre-ordered will have early access to drafts of book two and three. Come on folks - we all want to SEE THAT VIDEO! You are off to a cracking start here. Since you are funding now I’d look at some of the formatting, grammar etc. Tweaks mainly. Good job!